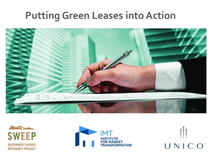 Watch IMT and the DOE Better Buildings' webinar for advice on how to get started enhancing your lease, learn how to apply to become a Green Lease Leader in 2019, and hear success stories and insights from Green Lease Leaders Kilroy Realty Corporation and JBG SMITH. 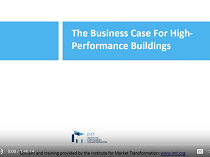 In November, 2017, The Institute for Market Transformation (IMT), with support from the U.S. Department of Energy, introduced The Business Case for High-Performance Buildings, a tailored course for real estate brokerage professionals to learn about the real costs and benefits of high-performance buildings and how to best support their clients. A version of this course has been taught in person and approved for continuing education credits in several states. To inquire about scheduling a course for your organization’s brokerage team, please reach out to Emily.Mclaughlin@imt.org. On June 3rd, 2015, the Southwest Energy Efficiency Program hosted the webinar Putting Green Leases Into Action. The webinar featured the experience of Unico Properties as they implemented energy-aligned leasing terms throughout their real estate portfolio. 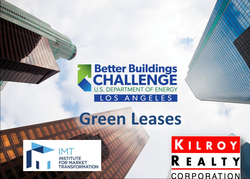 On April 15th, 2014, the LA Better Buildings Challenge presented the webinar Are You a Green Lease Leader? : Aligning Tenants and Landlords on Saving Energy. 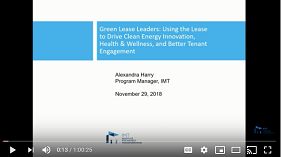 This webinar discussed the Green Lease Leaders program, and went into detail on the program is helping to cross the landlord-tenant divide. Kilroy Realty provided specific examples of how they implemented green clauses into their portfolio, and how tenants reacted to such changes. On March 11th, 2015, IMT and JDM Associates presented a webinar on Everything You Need to Become a Green Lease Leader. The Green Lease Leaders designation was created to recognize landlords, brokers, and tenants who successfully execute leases with sustainability and energy efficiency in mind. The webinar describes the program's requirements, and provides samples clauses for viewers to better understand the components of a green lease. To download the slides from the webinar, click here. 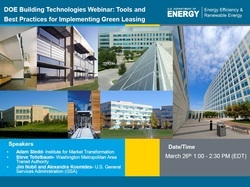 On March 26th 2012, The Department of Energy and Commercial Building Energy Alliance stakeholders held a webinar discussing how to use green leasing (or energy-efficient leasing) to overcome challenges presented by misaligned incentives between building owners and tenants in increasing the energy efficiency of commercial buildings. Note: Any opinions expressed by the webinar speakers or in materials found in the library are not representative of the opinions of the Green Lease Library partner organizations.